March 13, 2017, 2:35 PM · Congratulations to Los Angeles Philharmonic violinist and longtime Violinist.com member Vijay Gupta, who will receive the "Leonard Bernstein Lifetime Achievement Award for the Elevation of Music in Society" from Longy School of Music of Bard College tonight in Boston. Vijay Gupta. Photo by Mathieu Young. Gupta joined the LA Phil in 2007 at age 19 after completing his Bachelor of Science in Biology and his Master of Music from the Yale School of Music. Gupta is the founder and director of Street Symphony, a nonprofit organization that aims to uplift the spirits of people who are experiencing mental illness, poverty, homelessness and incarceration by bringing them live music. Since its founding in 2011, Street Symphony, with its socially-conscious musicians, has presented nearly 200 free, live musical engagements, performing in Skid Row, the greater Los Angeles Area and the LA County Jails. They perform a variety of music, from gypsy and jazz to classical. 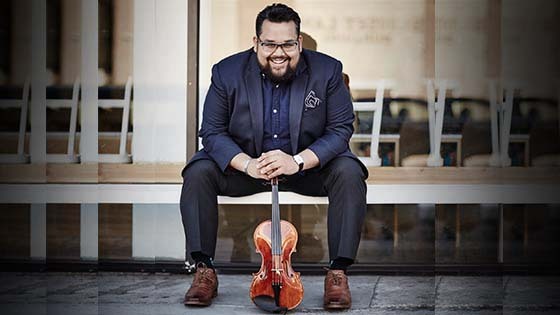 Gupta will receive the award at an event at Harvard University at which he also will speak and perform alongside Longy's Sistema Side By Side orchestra. "I'm...touched and humbled beyond words to be receiving the Bernstein award," Gupta said on Facebook. "I am immensely grateful to my colleagues at Street Symphony and the many communities of people in Skid Row and beyond who make our work possible." The award, endorsed by the Bernstein family, was established in 2000 by Longy to honor a performer or teacher who exemplifies how music can lift spirits, raise the level of culture in society, and transform lives. Past recipients include LA Phil Music & Artistic Director Gustavo Dudamel. Here is Vijay ("Robert") Gupta's TEDTalk from 2012, "Music is Medicine, Music is Sanity."